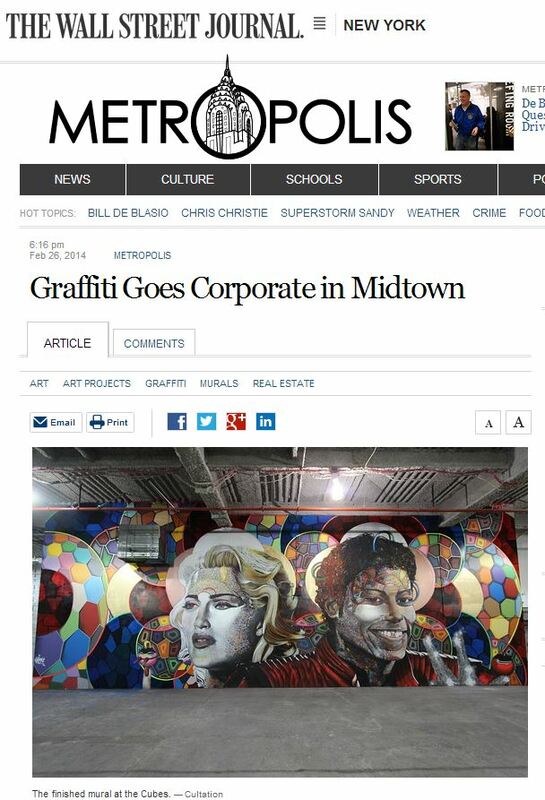 Congratulations to our Client Chor Boogie for his feature in The Wall Street Journal! His visionary works ignites the hearts and minds of the masses world wide. There is no color he does not use. He creates a wide range of forms pioneering his inverted can technique which slows down the pressure of the paint and creates dense, rich tones giving room for more detail on a broad perspective. Chor Boogie’s dynamic range of artistic styles can manifest as soulful, deftly shaded portraits to color therapy, geometric elements adding up to half hidden faces, and a minds eye or two to encourage you to see internally and externally. A splash of color has hit 120 West 42ndÂ Street after Equity Office commissioned artist Chor Boogie to spray paint murals at its retail development called the Cubes, which has not yet opened. â€œAfter experiencing numerous examples of Chor Boogieâ€™s work in Wynwood during this past Art Basel Miami, I knew Chor would do great things to the blank canvas of The Cubes,â€ said Mr. Huebener. Find out more at ChorBoogie.com!